JayeL Audio | The Klaxons: Mercury Winners? Is It A "Myth"? The Klaxons: Mercury Winners? Is It A "Myth"? 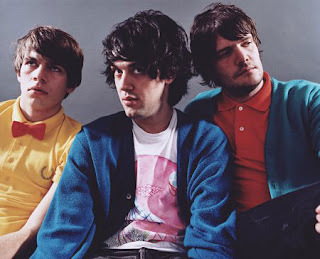 Home » albums, Electronic » The Klaxons: Mercury Winners? Is It A "Myth"? I have mentioned the Nationwide Mercury Prize a few times in posts, but haven’t really explained it. Basically, its an award show that highlights the best British and Irish albums of the past year. The albums nominated are voted on by a board of music executives from across the pond and usually don’t get much play in the States (sad, but true). Klaxons won this year’s prize for their 1st album, Myths of the Near Future. The album beat out the likes of Amy Winehouse, Arctic Monkeys (last year’s winner), and the New Young Pony Club. Now I would never call my self a journalist or a music critic, I just happen to like writing about music I feel others should pay attention to (or at least give a listen). I don’t have a literary degree or have ever been in a band, but I still like to voice my opinion. I just wonder how the “expert” voters came about choosing the Klaxons’ album over the list of other nominees. Don’t get me wrong, songs like “Golden Skans” and “Gravity’s Rainbow” have been in heavy rotation on my i-pod since I heard them. I can definitely appreciate that the band is leading the way in the creation of the “new rave” genre. The fact of the matter is that Myths of the Near Future is an uneven album, as I mentioned in an earlier post. I may have even been a bit harsh in my initial review, the album was probably a 3 after few more listens. But I have a hard time believing its the best Brit or Irish album of 2007. Especially in comparison to Back to Black and Favourite Worst Nightmare. I am sure Ms. Winehouse will get her due and the Arctic Monkeys got their fair share of praise last year, I just think Klaxons should be rewarded in the “Future”, when they create a more focused record.